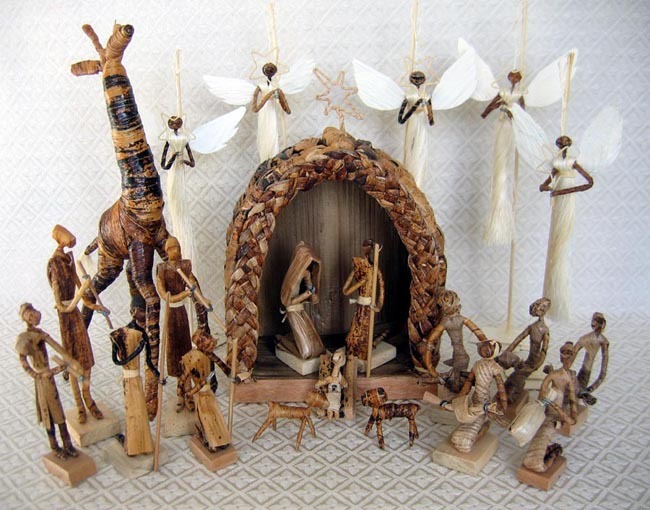 This Nativity scene is handcrafted by native women in Uganda. The figures and stable are made from wire frames wrapped ingeniously with banana leaves. The scene contains 21 figures: Joseph, Mary, the baby Jesus, five shepherds, two sheep, a giraffe, five angels made from sisal, and five wise men kneeling with their gifts. The standing shepherds are 6 inches tall. The stable has a wooden base and banana leaf walls. The stable is 6.5 inches wide by 8 inches tall, not including the star on top. The giraffe is 12 inches tall.